The BreedingBearded Barbet Lybius dubius is native to West and Central Africa, where it is to be found in tall trees at the edges of open woodlands, wooded grasslands and cultivation, in clearings in woodlands, and in small isolated forest patches or clumps of second growth on old plantations (Fry et al. 1988). It is a large barbet, basically black and red in colour, with the mid- to lower-back white. The flanks are creamy white. It has a large, grooved yellow bill, with two 'teeth' each side, and the bare skin around the eyes is also yellow. Four of these birds were offered for sale in July 1997. They were in good feather, although a little rough, as softbills often tend to be in dealers' hands and one bird had a badly dropped wing and seemed unable to fly. However, it managed to get about the flight by climbing up the wire. One bird seemed to be slightly larger than the rest and, while all four would flick their tails from side to side while being watched this was the only one to vocalise, producing a loud 'caw'. At the time I had no information concerning the sexing of the birds, so I obtained all four, suspecting there was at least one male in the group. Later I discovered that the female can be distinguished from the male by the presence of black spots on the flanks (Fry et al. 1988). It was possible to see these spots without catching the birds and this confirmed that I had one male and three females, the male being the slightly larger bird, as I suspected. After a few days in a large cage, the four birds were placed in an aviary measuring 8ft deep x 5ft wide x 6ft high (approx. 2.4m deep x 1.5m wide x 1.8m high). This is one of a series of flights having the rear and one side enclosed as is the rear half of the roof. Therefore the birds were only exposed at the front. There was some dry heather hanging at the back of the aviary, left from the previous occupants, a flowering currant bush was growing along the open side and there was a large abutilon bush near the front trimmed back to just below the roof. Before the birds were put into the aviary a block of rotten birch measuring 1ft 8in wide x 2ft high (approx. 51cm wide x 61cm high), hut only 8in (approx. 20cm) deep, and a wooden nest-box 2ft 6in high and 6in square (approx. 76cm high x 15cm square) were hung along the covered side. From the first night all four birds roosted together in the box. There was a feeding tray near the front of the aviary and a water dish was placed on a pine log approximately 3ft (91.5cm) high. The birds are fed on a mixture of chopped fruits. Initially the fruit was mixed with a commercial softfood, but the birds were reluctant to take this and later the fruit was coated with a dry baby cereal. Softfood was offered in a dish and usually was only eaten when all the fruit had been consumed. Fruits offered were banana, apple, pear, tomato, grapes, kiwi fruit, melon, peach, plum and occasionally tinned fruits. All fruits were chopped to a size suitable for swallowing whole and all were consumed, although apple and banana were the least favoured. Occasionally chopped orange was added to the mixture and was readily eaten. Blackberries, elderberries and raspberries were always refused. Later, I found that a pomegranate, cut in half and wired into place, would also be eaten. Livefood, mainly in the form of mealworms, was eaten readily, but later on very little interest was shown in it until the birds began to breed. On this diet the birds have retained their red colour perfectly without the aid of artificial colour-feeding. In his account of breeding the related Double-toothed BarbetLybius dentatus, Derrick England said that he found his birds to have marked preference phases, often selecting one type of fruit only. He also found that there were days when his birds did not eat at all (England, 1976). My birds have never behaved in this way. The birds' plumage greatly improved after a couple of weeks in the aviary and gradually the bird with the dropped wing recovered to the extent that it could fly again and the wing is now only very slightly displaced. Unfortunately the birds are not ringed, making it difficult to distinguish individuals, especially from a distance. This has restricted the amount of detailed behavioural information that has been obtained. After a week or so in the aviary the birds began to excavate a hole in the section of birch. This progressed rapidly and in a very short time they had bored right through the block. The birds have always remained nervous of being watched and I never could determine how many birds were involved in the excavation. I installed a section of pine log hut this proved too hard for the birds and while some of the bark was removed, no further progress was possible. I then managed to locate a section of rotten birch. This was about 3ft (91.5cm) high and 1ft 4in (40.5cm) in diameter. It was placed on the pine log at the front of the aviary in such a way that the top was about 6in (15cm) below the aviary roof. For a week the birch appeared to he ignored and then one morning I found that a hole had been started about 6in (15cm) from the top of the log. Fortunately this was on the side of the log facing across the aviary front and so could easily be observed. By the same afternoon progress was such that I could see just the tip of the tail of an excavating bird. The bird backed out with a beakful of wood chippings that it dropped from a perch half-way down the aviary. This was the only time I caught a bird in the act of excavation. As the birds were recently imported, my intention was to remove them from the aviary at the first sign of discomfort as the weather deteriorated, but in the event the winter of 1997-1998 turned out to be mild and there was never any need to take the birds indoors. The fact that all four slept together in the birch log was a definite advantage. The barbets came through the winter in fine condition and the first indication of any change was on April 26th 1998, when I heard a different sound coming from the aviary. At the time I noted this as a slow, 'chop, chop' sound repeated many times. As the birds were so wary I could not determine which bird was making the call for as soon as they saw me they moved to the back of the aviary. By the second week in May I only ever saw three birds in the aviary at one time, so it seemed that they might be nesting. Unfortunately, it was not possible to know whether it was always the same bird that was missing. On May 19th a broken white egg was found on the aviary floor, suggesting that it may have been laid from a perch. This later disappeared, presumably eaten by the birds. The next day I put a pot of mealworms into the aviary and stayed to watch. The male repeatedly collected one or two mealworms at a time and fed them to one of the females that simply sat on a perch and waited for him to bring them to her. The mealworms were always swallowed and regurgitated to the female. A second female was in the nest throughout this, while the female with the dropped wing took no part in the proceedings. Nothing resulted from this nesting attempt although one or other of the birds continued to spend long periods in the log. It was very frustrating not being able to see what was going on inside or to know which individuals were spending time in the log. The first indication of success was on August 21st when a deep croaking was heard from inside the log. Initially I thought this indicated a large nestling, but later I heard the sound from one of the adults in the aviary. By mid-day the fruit dish was empty, as was the dish of softfood, which was most unusual. Fresh fruit was supplied, together with a dish of mealworms and immediately three of the four birds began to take beakfuls of mealworms to the nest. The birds worked in relays, each waiting its turn at the entrance to the nest. This was the only time I saw them carry mealworms in the bill and they dropped many in the process. I could not determine which bird was not participating in the feeding. It seemed certain that at last they had young. Livefood consumption was never very high and I supplied about a tablespoonful of mealworms three times daily. In addition, I offered waxworms, half-grown locusts and thawed, frozen crickets. They only displayed interest in the latter, but these were taken only when mixed with the mealworms. There is no doubt that the nestling was fed fruit from a very early stage. The birds would not visit the nest if I was nearby and I could only watch what was happening by remaining hidden behind a bush about l5ft (approx. 4.5m) from the aviary, so it was not possible to record many details. It was September 1st before all four birds were seen together in the aviary and from then on much less time was spent in the log. On September 17th I managed to reach the aviary just after an adult had entered the log and I could hear faint 'mu-mu-mu-mu' sounds coming from the nest. On September 19th a young barbet was seen looking out of the nest entrance for the first time. It was not overly shy and did not withdraw very quickly, enabling me to see that the red on the throat was every bit as brilliant as that of the adults. The bill was considerably smaller and there was no sign of the 'teeth'. The adults did not appear to feed the chick at the entrance and would wait for it to descend to the nest chamber before entering to feed it. On September 24th I found that the adults had opened a second hole to the nest, apparently a little above the floor of the cavity. This revealed that the nest log had been excavated to a depth of at least 18in (46cm). The chick spent the next couple of days looking out of this hole. Each time I approached the aviary the adults uttered a loud 'carr' sound, presumably a warning call which was ignored by the chick, which continued to stare at me! The young barbet fledged on the morning of September 26th. In colour it was every bit as bright as the adult but there was a slightly greater area of black on the sides of the breast. The eyes were dark, in contrast to the yellow of the adults' and the bird was about three-quarters the size of the adults. The beard was much less well developed than in the adults. The beak was the same colour and about two-thirds the size of the adults' and, as already noted, there was no sign of the 'teeth'. This is in contrast to the description of the immature given in Fry et al. (op. cit.) where the immature is described as being "like adult but black and red duller, breast dull black, throat red mixed with black, base of bill dusky". The fledgling returned to the log that evening. From this point on it was out of the nest every day. I never saw the adults feed it, but then they had become even more wary at this stage. Once the young bird had fledged I could see that the flanks were unspotted suggesting that perhaps it could be sexed as a male at this early stage. The young bird was reared successfully and has remained with the group without any problems. This contrasts with the situation at St. Louis Zoo, where it was found that the male was inclined to attack the young on fledging (Tim Snyder, St. Louis Zoo, per. comm.). 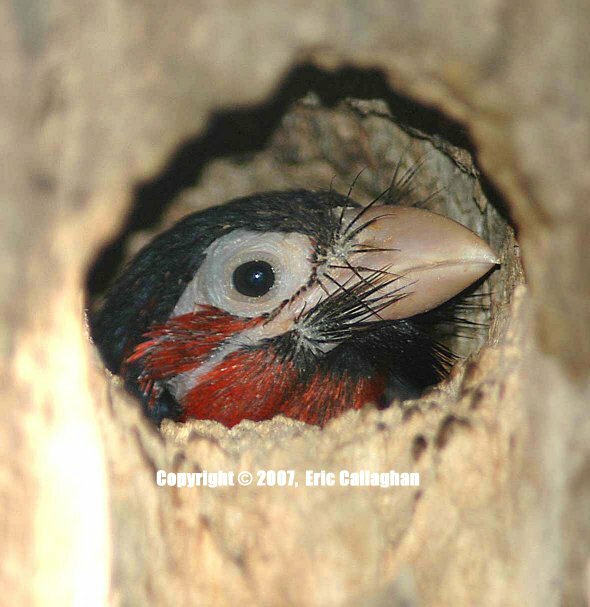 During the winter of 1998-1999 the barbets bored a number of holes in the nesting log at various levels. At the time of writing (March 1999), they are again showing interest in spending time in the log. This is similar to the situation at St. Louis Zoo, where the birds continued to re-use the same log, in spite of having added more holes (Tim Snyder pers. comm.). Even now, with the renewed interest in nesting, the young barbet remains fully integrated in the group. England, M.D,. (1976). Breeding the Double-toothed Barbet Lybius bidentatus. Avicultural Magazine. 82.4:191-193. Fry, C.H., Keith, S. and Urban.E. (1988). The Birds of Africa, Vol. III. Academic Press. 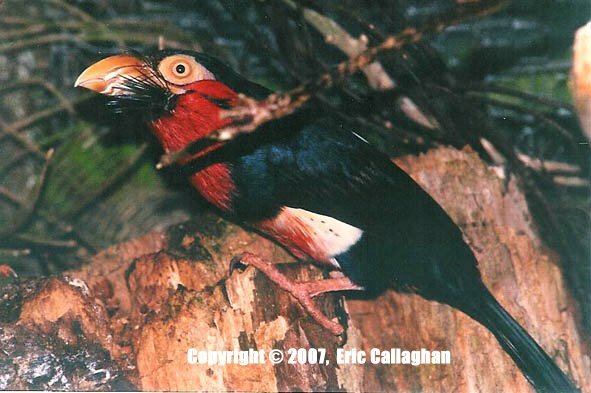 As described above, the Bearded Barbet Lybius dubius, has been bred by Eric Callaghan. This is probably the first successful breeding of this species in Great Britain or Ireland. Anyone who knows of a previous breeding is asked to inform the Hon. Secretary.